Oh good lord no. Barely more than an incredibly ugly flash game with almost no strategy or depth to it, which is kind of counterproductive when you’re making a tower defence title. Ah, now this is more like it. Far less painful to look at, and while the graphics still retain a static quality to them there’s a couple of added elements which do the gameplay a world of good. You are an AMERICAN fighting for FREEDOM during WORLD WRESTLEMANIA II. Japanese approach your base in ship and boat and tank and car, and your job is to gun them down with machine gun and cannon and flamethrower all of which come in handy prepackaged tower form. There’s only six or seven tower types (which is one more than the original iBomber Defence) and there’s a similar between-mission upgrade mechanic where you unlock more upgrade tiers, so no real surprises there, but what changes things up significantly is the Dig In mechanic. This is a separate option from upgrading; Digging In a tower will increase its health, firepower and range at the cost of limiting the tower to firing in one fixed direction, which can be changed manually by the player. 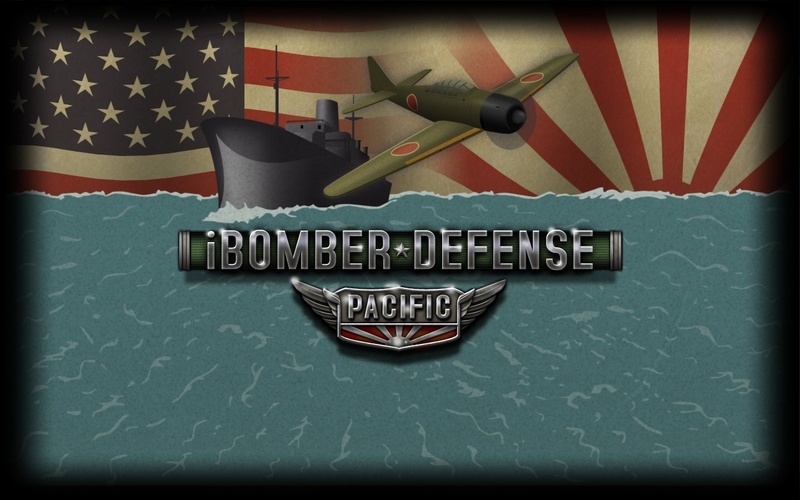 This one little change turns Pacific into a whole new game. Rather than watching hordes of little men march suicidally into your guns while you surreptitiously check your watch and wonder when the level is going to be over, you’re instead frantically chopping and changing your tower sightlines to deal with a new threat that’s appeared on the horizon. The level design in Pacific is pretty good; you’ll rarely have the money (or the building space) to build a set of towers to cover all the approaches, so you have to make your towers multitask. 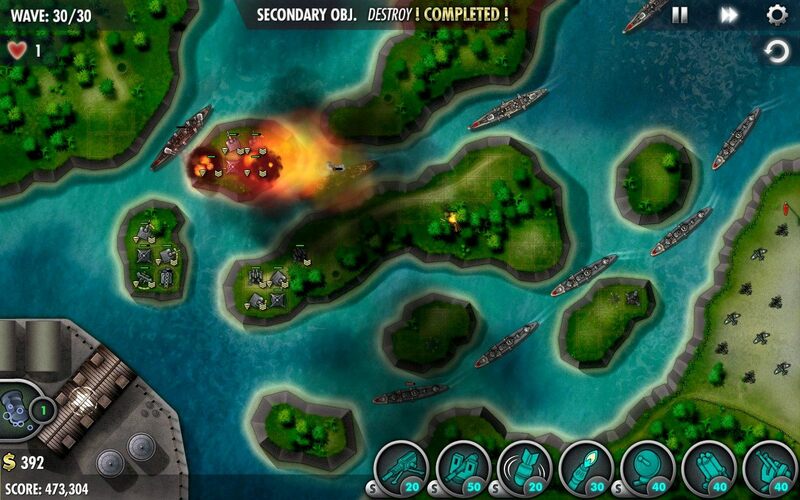 Often this involves softening one wave coming from one direction up with a bomb or two, taking it out quickly, and then moving your towers around to point at a second wave coming from another direction; together they would have overwhelmed your defences, but by dividing and conquering it’s just possible to survive the onslaught. It’s a mechanic that demands some thought and interaction from the player beyond simply placing the towers, which is where most tower defence games fall over. For £3 Pacific is actually a fairly neat little game if you like the genre; my one problem with it is that the levels are really, really long (forty waves! And they’re not short waves either!) and if you fail a wave you only get one do-over. Failing wave 39 twice will boot you back to the beginning to repeat the previous 38 waves, which is possibly the dumbest way to deal with restarts I can think of. What happened to checkpoints, guys? It’s finally happened; somebody made a game out of one of those oscilloscopes you probably used in your secondary school science lab. In Waveform you are a pulse of light or something, and you’re trying to pick up coloured balls strewn along your flight path. Except! Because light is a wave you are not travelling in a straight line. Instead you weave up and down the screen in a sinusoidal wave, and in order to grab all of the balls you have to match their patterns by adjusting the wave’s amplitude and frequency. This is vaguely diverting for a while but eventually you get used to it, and if that was all there was to deal with Waveform would be a very short – not to mention boring – game. 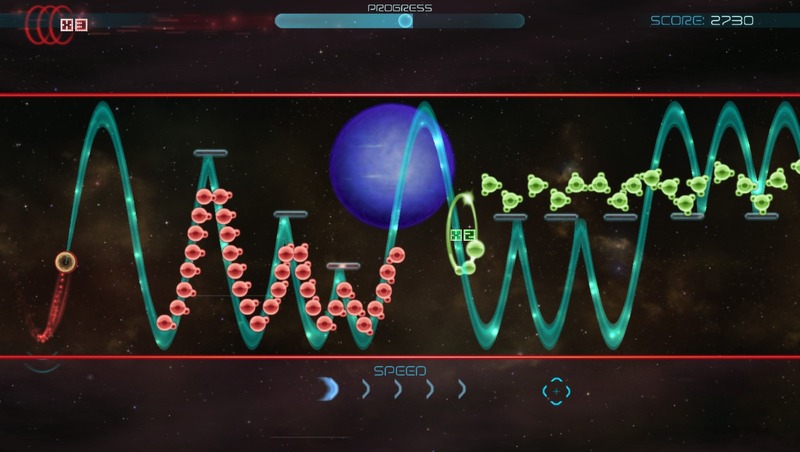 Fortunately the developer has chucked in a bunch of obstacles and gimmicks to liven things up; hitting a chunk of dark matter will slow you down and possibly force you to restart the level if your light pulse isn’t fat from eating lots of balls, while mirrors reflect the wave path and light tracks must be matched exactly in order to get maximum points. The gimmick levels go a little bit too far, however – I only played two of them, but the first warped the screen and made it go all floopy and made me feel a little bit sick, while the second faded the game to black repeatedly. This is a PC game and that’s the sort of thing I tend to associate with a terminal illness afflicting my graphics card or my monitor, not a refreshing new gameplay mechanic. Sadly Waveform goes too far and too fast; even for an accredited physicist it’s difficult enough to grapple with changing amplitudes and frequencies and wavelengths at the best of times, and about twenty levels in (the levels take a minute or two each) I was having to adjust my waveform on the fly while bouncing it off of multiple mirrors while following a light track inside a very narrow dark matter field. This is why we developed computers in the first place: so that we wouldn’t have to deal with doing this sort of thing ourselves. Waveform is a fun enough game to play in short bursts, but the difficulty curve may be a little too steep for some.